Eat Your City: New York Times Best Chocolate Chip Cookies Recipe, and a nice soft tender cookie version! 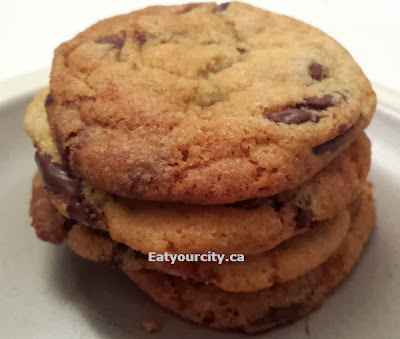 New York Times Best Chocolate Chip Cookies Recipe, and a nice soft tender cookie version! Posted by I've been hunting down a really good chocolate chip cookie for a long long time. Now everyone's definition of a "best" chocolate chip cookie varies as some love crispy, while others like soft or chewy cookies, but its pretty plain that the chocolate chip cookie had better taste pretty freaking amazing. My personal preference is warm soft out of the oven with rich caramel-y flavors complementing the chocolate (but with no actual caramel added to the recipe)... and it turns out New York Times had did the legwork back in 2008 on their search for the best chocolate chip cookie recipe out there... and who wouldn't want to bite into the best chocolate chip cookies out there? 1) The cookie dough would rest in the fridge for 24-36 hours so the butter can reform and all the ingredients get hydrated.. resulting in caramel and complex yummy flavors developing. I've tried making these gargantuan mini pizza sized cookies before, and they're so big, its a meal in of itself (a very guilty meal heh.). Since I was test baking these out and anticipated to be giving them out for Christmas, and random times I feel like baking up a whole heck of a lot of them, I wanted to see what happened to the cookies after cooling. Since the cookies take 3 days of sitting in the fridge (yes, do the full 3 so you get the best tasting cookies! ), and a bit of planning so you remember to bake them after 72hrs, I usually end up baking a lot since this recipe calls for so much attention and time. Also, unless I was some superhero in the kitchen, baking hundreds of cookies = 99% of them were going to be delivered cool and boxed up nicely or slipped into large ziplock bags a few hours later or the next day. -1 1/4 pounds bittersweet or semi-sweet chocolate disks/fèves/chips, (60% percent cacao content or higher), I've used 3/4 dark chocolate and 1/4 milk chocolate with very happy taste testers.. use whatever chocolate makes you happy! 1. Sift flour into a bowl and set aside. 2. Using a mixer fitted with paddle attachment, (or a big wooden spoon and muscles) cream butter, baking soda, baking powder and sugars together until very light, about 5 minutes. Add eggs, one at a time, mixing well after each addition. Stir in the vanilla. Reduce speed to low, add flour and mix until just combined, 5 to 10 seconds. Drop chocolate pieces in and incorporate them without breaking them. 3. Scoop out dough and portion into 4-6 chunks and form them into logs with plastic wrap. It makes it much easier to portion out later as the dough turns rock hard after a few days in the fridge. Refrigerate for 24-72 hours. Dough may be used in batches, and can be refrigerated for up to 72 hours. 4. When ready to bake, position the oven racks to the top 1/3 part of the oven, preheat oven to 350 degrees. Line a baking sheet with parchment paper or use a nonstick baking mat or non-stick cookie sheet (I love the heavy duty Wilton's cookie sheets!). Scoop out 1-1.5 inch diameter balls out dough and roll them so they're nice and round (about the size of a golfball or pingpong ball). Space them out about 1.5-2inches apart on the pan. Sprinkle lightly with sea salt and bake until golden brown but still soft, 11-12 minutes. Let sit on pan for 1-2 minutes to set, then transfer cookies to a cooling rack to cool. Eat warm, with a big napkin. Thank you for your test run & the improved recipe, I'll test it myself, since I've been searching for a "chewy" (till next day) chocolate chip cookie recipe for years by now. do you have to leave the cookie dough out until it reaches room temperature before rollingthem out and popping them into the oven? Its much easier to roll out the cookie dough after it has a chance to warm up a little bit (especially if you tossed it in the freezer for later). However to avoid your cookies turning out into greasy puddle of crispy sugar - always place rolled balls of dough back into the fridge to cool and harden up. I find if I pop the dough balls in a single layer (in a bowl or cookie pan) back in the fridge, and turn on my oven...the time it takes for my oven to heat up to tempurature is enough time for the cookie balls to cool down and firm up enough to bake out beautifully! Alternatively, prior to letting the dough harden and sit for 72 hours, roll the cookie dough into balls.. I find the dough SUPER dooper soft and a bit hard to handle right after mixing it, so sometimes I roll them all out after its been in the fridge for an hour or so.